up the side of the magnificent Beartooth Mountain Range through a series of steep switchbacks and zigzags. 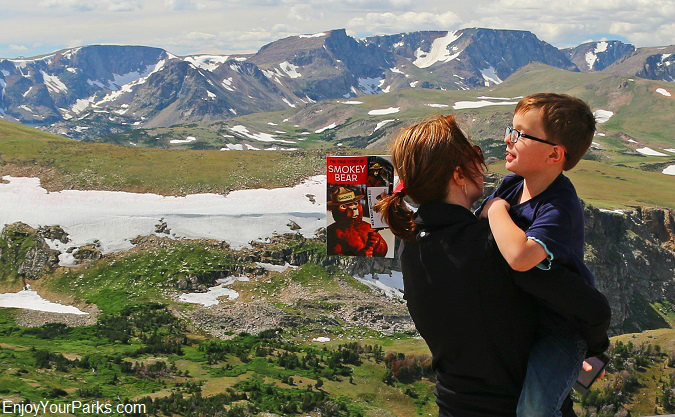 After leaving Red Lodge, Montana, the Beartooth Highway rises from 5,200 feet to over 9,000 in just 13 miles. This magnificent highway then reaches its highest elevation of 10,947 feet above sea level at Beartooth Pass before it begins its long descent towards Cooke City, Montana, which is located just outside the Northeast Entrance of Yellowstone National Park. Once the Beartooth Highway abruptly climbs to the 8,000 feet level after leaving Red Lodge, Montana, the highway then somewhat levels off as it reaches a wide alpine plateau near the top of the Beartooth Pass. 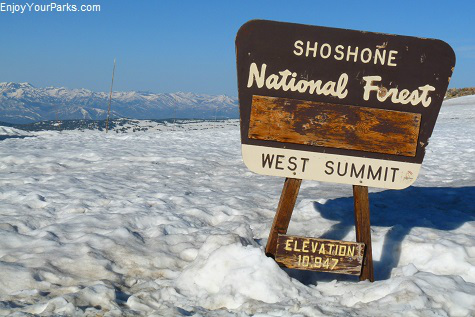 This plateau is where you will enjoy many breathtaking vistas as you drive on what seems to be the "Top of the World." 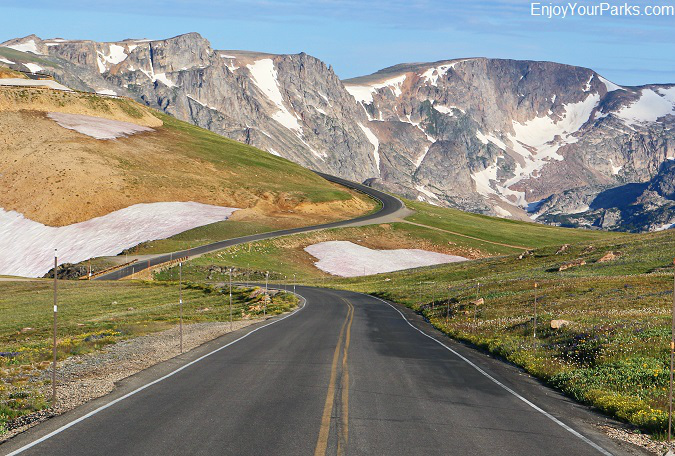 The Beartooth Highway is unquestionably one of the most scenic drives on earth. high plateau that indicates which state you are actually in. 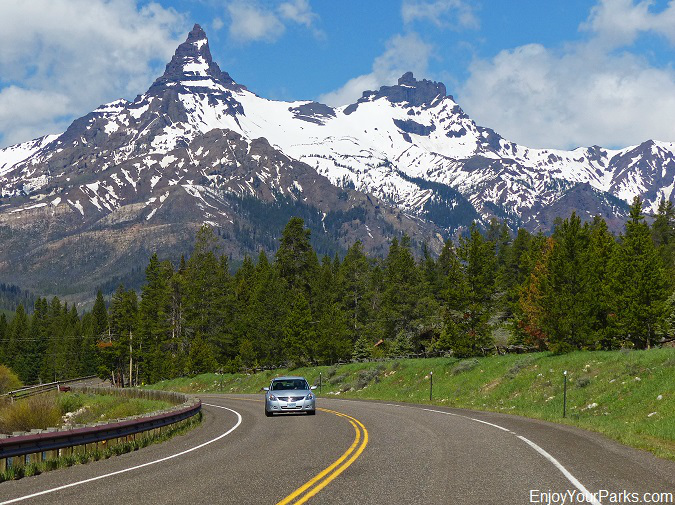 Whether you're in Wyoming or Montana along this incredible scenic byway, the grand views to the north along the entire plateau is actually in the heart of Montana's Beartooth Mountains. The Beartooth Highway is a very popular route for visitors heading for Yellowstone National Park from the east on Interstates 90 and 94. Once you leave the freeway and reach Red Lodge, Montana, your journey up the Beartooth Highway begins. 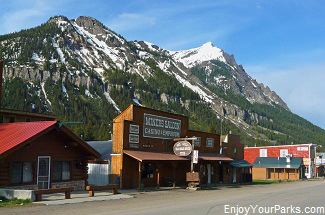 And 69 miles later you will end up at Cooke City, Montana, which rests only a few short miles from the Northeast Entrance of Yellowstone Park. 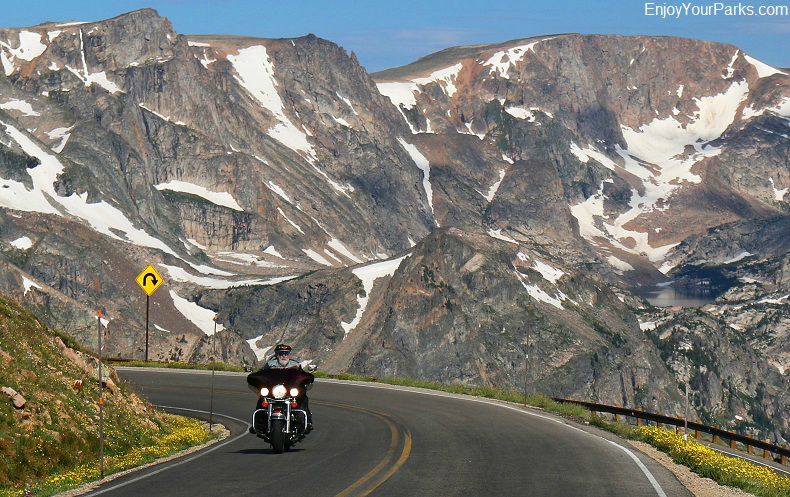 The Beartooth Highway is a favorite among motorcycle enthusiasts. 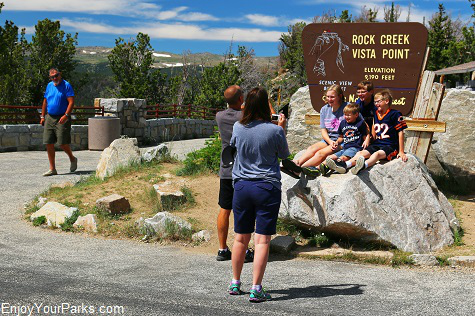 Visitors posing for a photo along the Beartooth Highway in Montana. 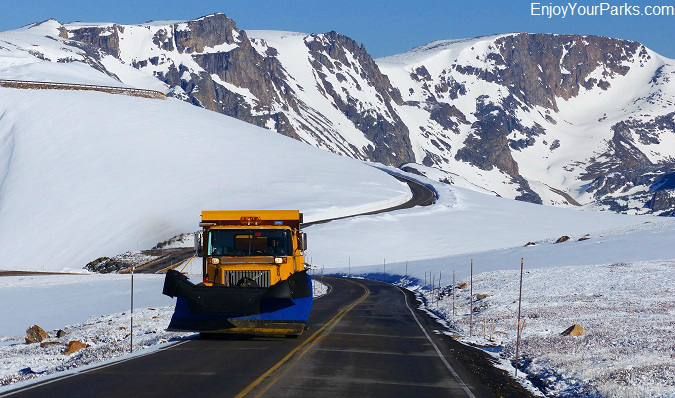 Because the Beartooth Highway reaches such high altitudes, snowstorms can suddenly occur even in the middle of summer, therefore visitors must always be prepared. A warm jacket, hat and gloves are a really good things to have in your car. Also because of the altitude, there can be extremely strong winds at times, as well as severe thunderstorms. Therefore, be prepared for any and all weather conditions while driving this "All-American Highway". Not only bring warm clothes, but also wind-breaking apparel. 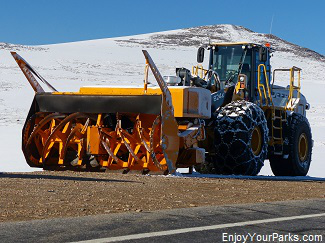 This will help make your trip over the Beartooth Pass much more enjoyable. And with this being said, it's always a good idea to check with the Red Lodge Chamber of Commerce or the Beartooth District Ranger Station before you head up the mountain, or check online with the Montana Travel Information and Wyoming Travel Information just to make sure there is not a severe weather advisory being issued. Snow can be a factor any time of year on the Beartooth Highway in Montana. 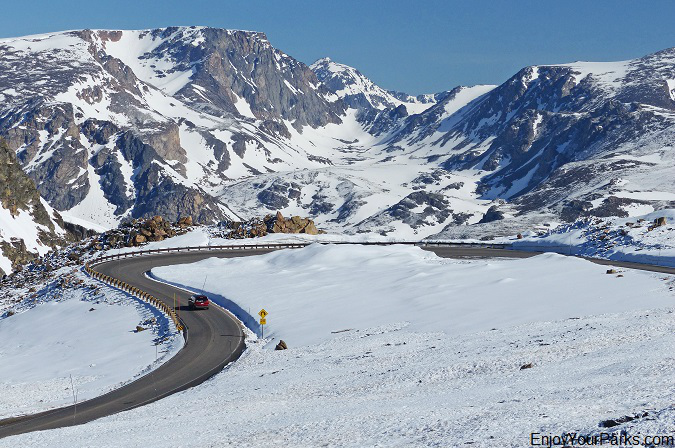 The Beartooth Highway can get hit with a snow storm during any time of the year. When Is The Road Open? And due to the elevation of the Beartooth Highway, this road is closed during the winter, as well as usually late fall and early spring. 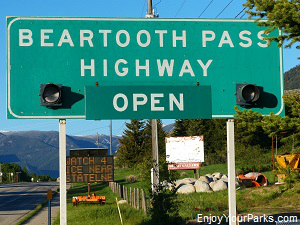 On a normal snow year, the Beartooth Highway usually opens on or just after Memorial Day, and closes sometime in mid October, historically around Columbus Day. The exact dates changes every year because it is snow and weather dependent. The 69 mile long Beartooth Highway, which runs between Red Lodge, Montana and Cooke City, Montana takes anywhere from 2 to 3 hours for the typical visitor. This of course depends ultimately on how many times you stop to take in the view and take photos. 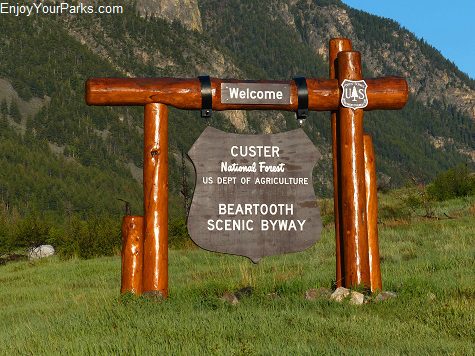 There are many overlooks and turnouts along the Beartooth Scenic Byway, and we encourage you to take your time and stop at all of them. 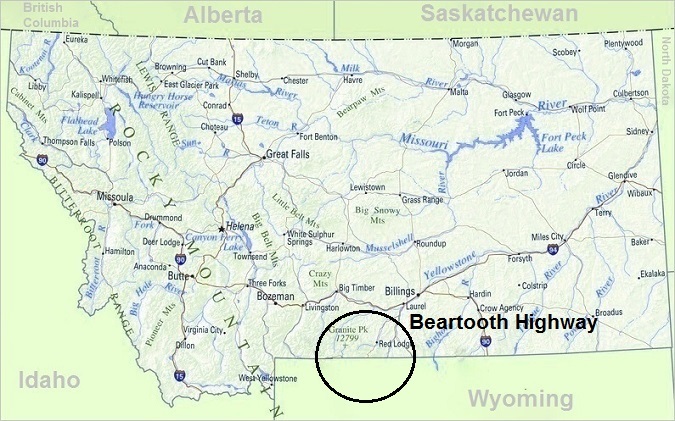 The drive over the Beartooth Mountains should be an event, rather than a means to get from "point A" to "point B". We've spent up to 5 hours on this amazing road before, especially on a warm day with no wind or thunderstorms, and when the wildflowers are in full bloom. Wildflowers blanket the alpine tundra during the summer months on the Beartooth Highway in Montana. 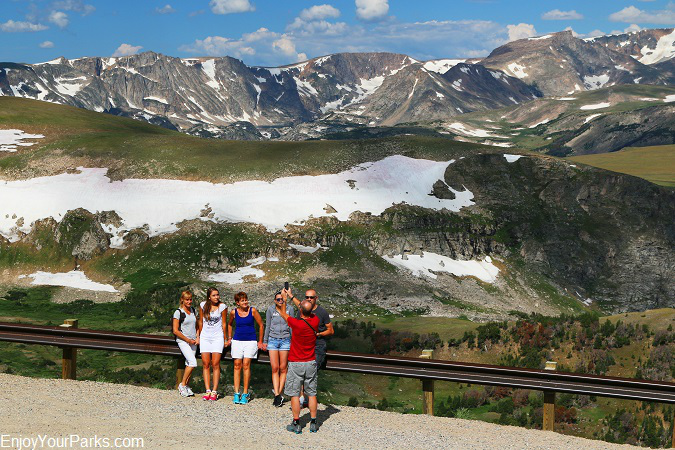 We recommend that you give yourself about 3 hours to drive the Beartooth Highway so you can enjoy it. The highest point on the Beartooth Highway is at Beartooth Pass, which is 10,947 feet above sea level. It's amazing to think about a highway reaching such an altitude. The Beartooth Highway allows visitors from all over the world to stand on a mountain plateau at 10,947 feet, and see "forever" in all directions. It is such a treat because normally most people would never experience this elevation. 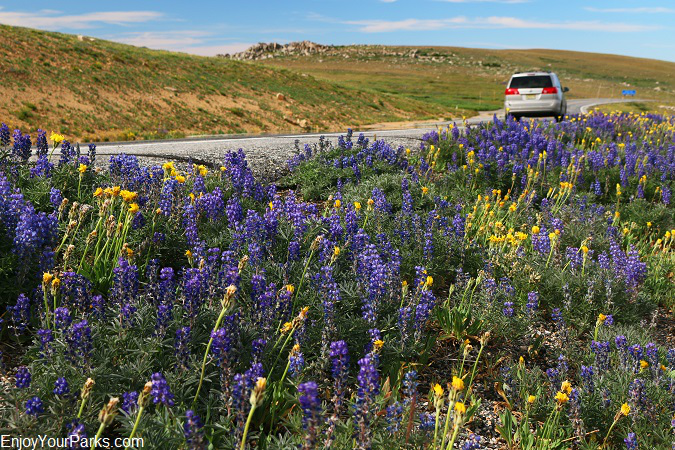 And for visitors to see first hand the high altitude tundra and wildlflowers that inhabit this high altitude plateau is also a special bonus while driving "on top of the world." And in many cases, it's the first time visitors will have ever touched snow! Wilderness. The Beartooth Mountain Range is responsible for all of Montana's 26 peaks that are over 12,000 feet, including Granite Peak, which is the highest peak in Montana at 12,799 feet above sea level. There are 25 small glaciers throughout the Beartooth Mountain Range, with Grasshopper Glacier being the most famous and unique. Over 300 alpine lakes dot the landscape of this wild country as well, and are well known for their exceptional trout fishing. Nearly 400 species species of plants have been found to exist in the Beartooth Mountain Range, and many biologists consider this massive mountain range to be the most biologically unique mountain range in North America. This wild area is home to one of the largest grizzly bear populations in the lower 48 states, as well as mountain goats, bighorn sheep, elk, bald eagles, mountain lions, moose, black bears, cutthroat trout, mule deer, lynx, wolverines and now grey wolves. 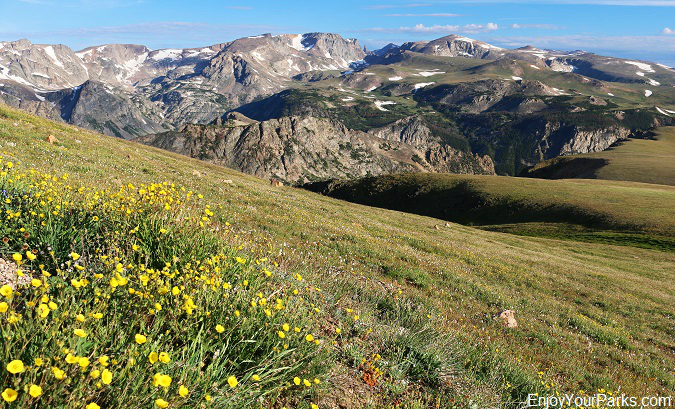 The high altitude plateau is home to plants of alpine tundra, which do include a host of wildflowers that cover this open and vast area during the summer months. 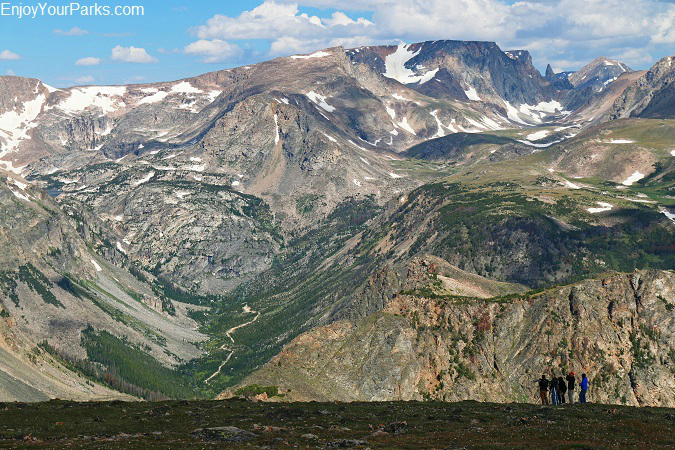 These visitors are dwarfed by the massive granite mountains of the Beartooth Mountain Range. A view of Montana's Beartooth Mountains from the Beartooth Highway. The Beartooth Mountain Range has 30 peaks over 12,000 feet... 26 are in Montana. 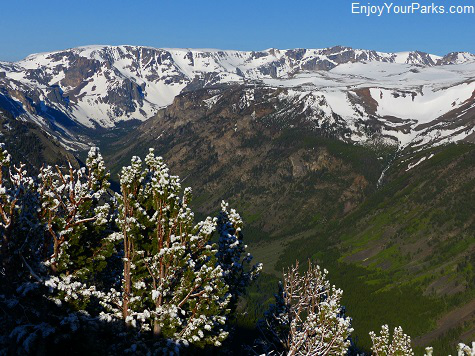 The Beartooth Plateau is the largest expanse of land over 10,000 feet in the United States. This photo is just a small section of this massive high altitude plateau. The Beartooth Mountains rest on a gigantic high elevation plateau, which is actually the largest true high elevation plateau in the United States. 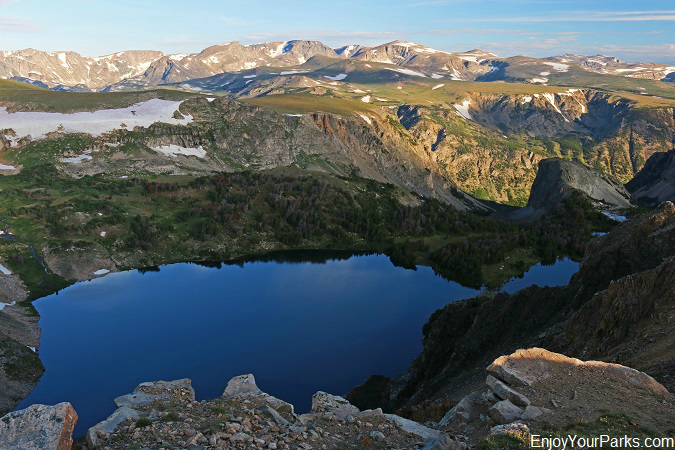 The Beartooth Plateau is in fact the largest section of land above 10,000 feet in the United States. 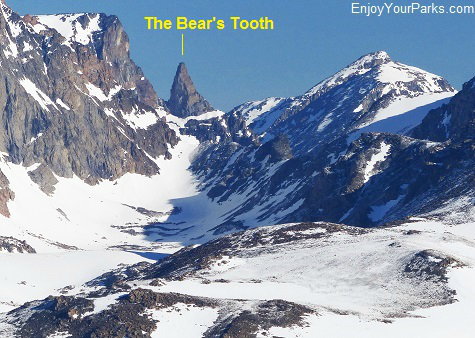 The name "Beartooth" came from a rugged spire that is shaped just like a bear's tooth. This famous spire can be scene from the Beartooth Highway as you look into Montana to the north, and there is a scene showing you its location. The Beartooth Highway is regarded as a civil engineering marvel, as it weaves its way through many switchbacks and zigzags up the side of this massive mountain range before reaching the high altitude plateau. Construction began on the Beartooth Highway in 1931, and was completed in 1936, where the official opening was on June 14. The cost to build this amazing road was about 1 million dollars (which would be about 18 million in 2015), and was a part of a nationwide series of National Park approach highways. Several Red Lodge leaders were pushing for its construction years before it came a reality, and many skeptics called it "Red Lodge's Pipe Dream". When approval came for federal funding in 1931, the Red Lodge locals recall that it was the biggest celebration Red Lodge had ever seen. Just one of over 300 alpine lakes that our found in the Beartooth Mountains. This lake is located directly below the Beartooth Highway, so everyone can enjoy its beauty. Many years earlier, in August 1872, the Beartooth Pass was actually crossed by General Philip Sheridan, a Civil War general, with 120 men as they were returning from an inspection tour of of the newly created Yellowstone National Park. Sheridan wanted to take a short cut back to Billings, Montana, and consulted a seasoned hunter by the name of Shuki Greer. This old hunter knew the mountains like the back of his hand, and told the party exactly where to go to successfully get over the mountains safely. The Beartooth Highway follows this original route that Sheridan took to cross over the top of these treacherous mountains. Located in Montana and Wyoming, the Absaroka-Beartooth Wilderness is 944,000 acres in size, and includes two major mountain ranges, which is the Beartooth Mountains which are made of granite, and the Absaroka Mountains that are composed mostly of volcanic and metamorphic rock. 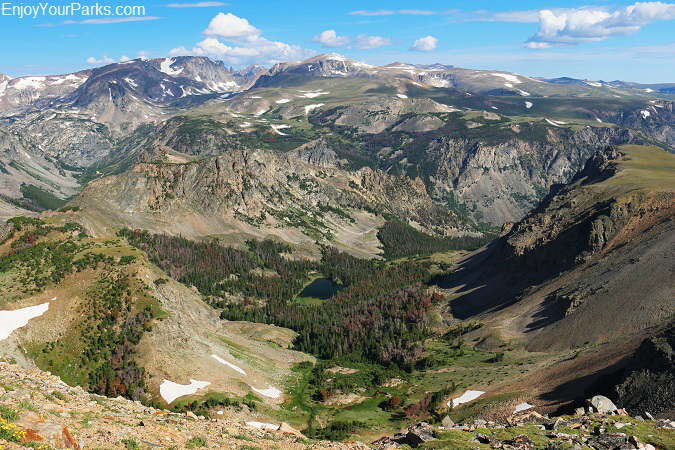 The Absaroka-Beartooth wilderness contains 30 peaks over 12,000 feet, with 26 of those peaks are located in Montana. This vast wilderness is also home to the largest land mass over 10,000 vertical feet in the United States. The highest point in the Absaroka-Beartooth Wilderness is Francs Peak in Wyoming, which is 13,153 feet in elevation, and the highest point in the Montana section of the wilderness is Granite Peak, being 12,799 feet above sea level. The Absaroka-Beartooth Wilderness is part of what is known as "The Greater Yellowstone Ecosystem", which is a massive 20 million acre area that surrounds Yellowstone National Park. 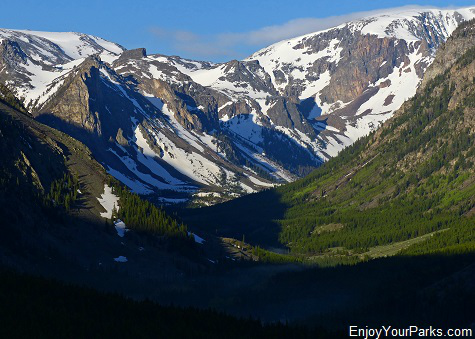 The Absaroka-Beartooth Wilderness is a whopping 944,000 acres in size. There are 700 miles of hiking trails in the Absaroka-Beartooth Wilderness, however access to these world-class trails are difficult from the Beartooth Highway. These trailheads are more easily accessed at the foothills of the Beartooth and Absaroka mountain ranges, which are located at the head of the major drainages found throughout the perimeter of these mountains. This is a view of Index Peak and Pilot Peak along the Beartooth Highway near Cooke City, Montana. The 69 mile long Beartooth Highway runs between the tourist towns of Red Lodge, Montana and Cooke City, Montana. 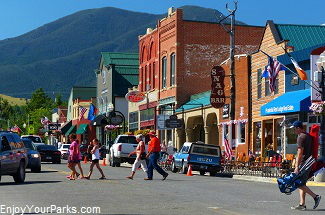 Both of these classic Montana towns are absolutely charming and great places to spend time in during your Beartooth Highway adventure. Both are completely different in character as you will learn, and both towns are an absolute joy to explore. Red Lodge is located southwest of Billings, Montana, and Cooke City is located only a few miles from the Northeast Entrance to Yellowstone National Park. 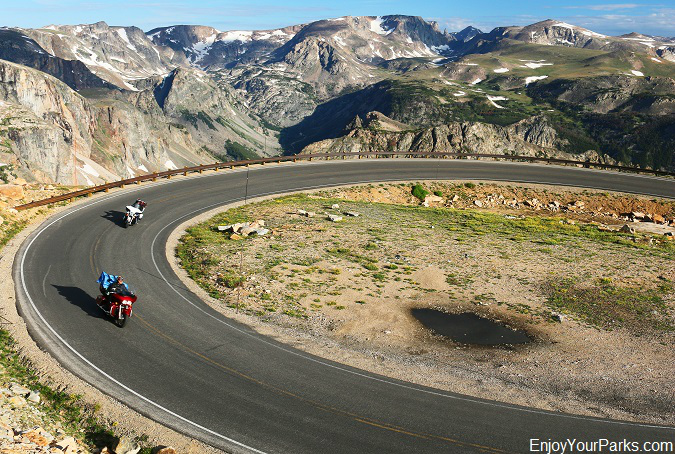 The Beartooth Highway is one of the most popular tourist destinations in Montana.